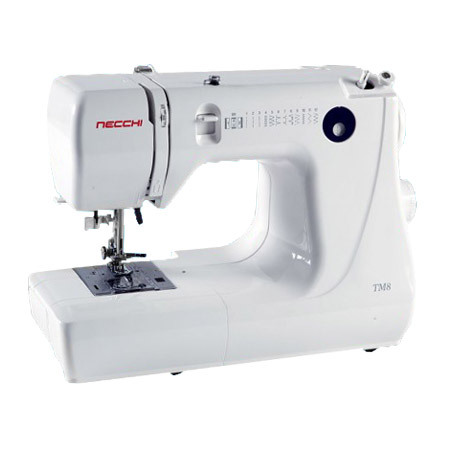 At only 12 pounds the Necchi TM8 is a compact, lightweight sewing machine that has all the features of a full size machine. This sturdy machine has high quality internal components like a jam proof top drop in bobbin and horizontal full rotary hook. Because of its size, it is the perfect machine to take out for those quick at home projects or use the convenient carrying handle for those times when you want to take your machine along with you. The TM8 features 9 built-in stitches and a four-step buttonhole. The built-in needle threader makes threading the needle a snap. Features also include an easy reverse lever, drop feed and extra high presser foot lift. The free arm lets you tackle the hems of pants and shirt cuffs with ease. This Necchi TM8 includes a FREE 1/4" foot. This is not packed with the machine by Necchi. We are offering it as a promotion.